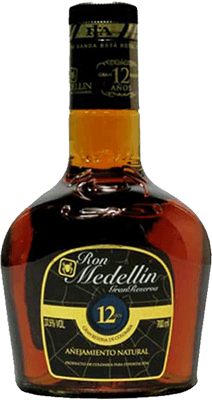 Have you found an online vendor selling Ron Medellin Gran Reserva 12-Year? Definitely a rum worthy of special occasions. To me there is a slight sweetness to it with a good warmth and not any harsh burn. Very light. Works extremely well in Coke Zero although most would recommend it by itself on or the rocks. Works any way you wish. Sweet aroma. The taste, not so much but with a fruity flavor at the start. Ends dry with a good amount of oak present. Enjoyable but very short finish and dryer than I usually like. I prefer sipping rums, and this isn't a bad one. Just doesn't stand out at all. Would drink again if offered to me but not one I will be purchasing for my shelf. Not bad but... Nice fruity first nose, more oaky afterwards. The mouth is a bit disappointing though it has a long warm finish. Vanilla and baked apple flavours, oaky. I would recommend the 10yrs anniversary edition of in Colombia. Same price but much better thanks to a nice blend of 10, 20 and 30 yrs reserve rums. This is a rough-tasting aged industrial rum, it does not really stand up to its Venezuelan or Panamanian counterparts. Nothing special, it may remind you of a another anejo, similar to Havana 7 or Abuelo. Not a lot of flavor on the palate, the caramel is there (likely added) and the alcohol burns off high in the sinuses. Dare I say it almost has a burned cane aftertaste. I have had this neat, on the rocks and mixed, and if you give it enough time on ice it will be fine. This rum goes against a lot of rums in the 12 year old class. Dry. Oak. Spice. More heat than most. Some leathery quality to it. This goes well with a cigar as it doesn't linger on the palate & isn't that usually sweet rum you get from companies that add sugar. Nothing special, but a decent rum. Key West 2019..
Obviously leaps and bounds over the 3 year this is a nice glass of rum to be enjoyed more than once. My first ever rum, or at least sipping rum. It's a good choice for beginners and I enjoyed it but I would be interested to go back and try it now I have other points of comparison. 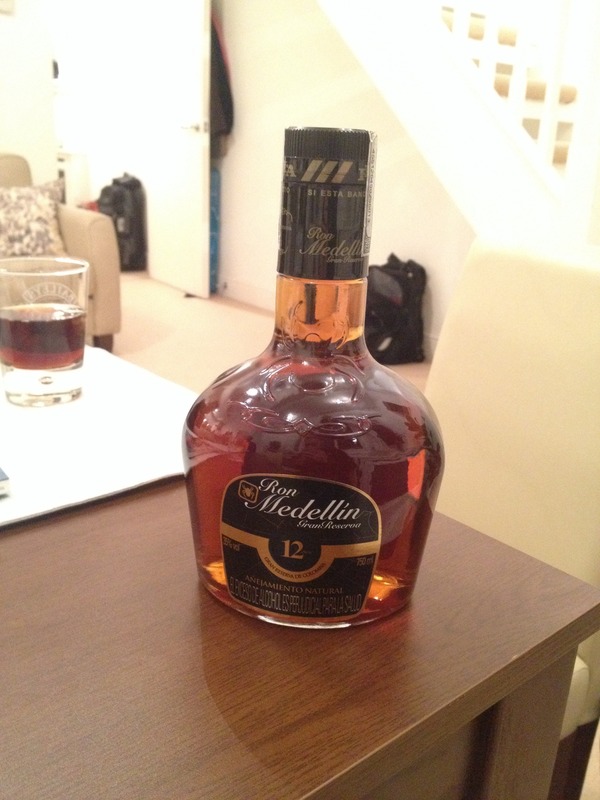 A friend of mine brought this bottle from over there, nice rum. Very tasty, little burn. not that long lasting. Un ron que mantiene los sabores característicos de un buen ron colombiano. Ron Medellin siempre demuestra su elevada categoría con rones de esta gran calidad. Lucky for me, my dad married a Colombian woman and goes to Columbia to see your family each year. He always bring me back a bottle or two so it's a staple in my house. Definitely a good option when I don't know what to drink. So many good rums hailing from Colombia and Ron Medellin Gran Reserva 12 year is not one of them. Surprisingly strong alcohol flavor and a very strong burn for a 12 year old rum. Only very marginally better than the 8 year old Ron Medellin. Honestly took me by surprise. Not a bad drop. The flavor is not amazing and the flavor is good. Most importantly it is not overwhelming sweet. For a beginner to Rum tastings it's perfect. I tried this neat and quickly added ice. It might be better with soda water (not coke). The rum has a nice flavor and aroma and it would be lost in coke. Tenhle me musel ale zklamat, jemny bez chute, neco jako duff beer. Bon rhum fruité limite florale avec un final marquant mais court, rapport qualité/prix trop élevé en France. This is the most wonderful rum which I drank. Unfortunately I of Bulgaria will not be able to buy it. This is my go-to rum when I am in Colombia. Smooth, flavorful, and a great value. I will drink this suave lady neat, and not feel guilty having her as a CubaLibre. Compared price-wise this would be the best rum to buy. But quality-wise it also stands out. Smooth and warm feeling in the mouth, not too strong aroma. Still have to compare it with the 10 year anniversary, but in the meantime, good enough for me!